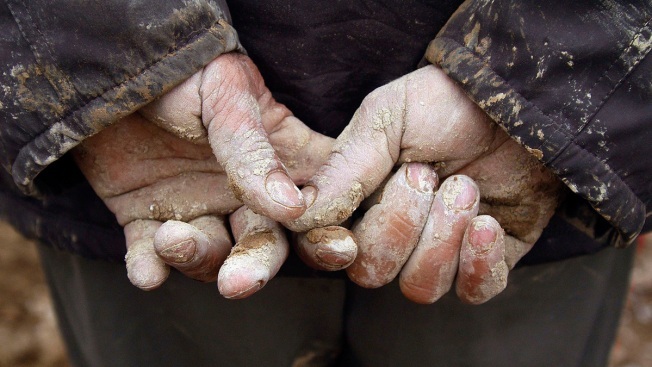 In this Feb. 23, 2005, file photo, a rescuer's hands are seen caked in earth from looking for survivors amongst the remains of buildings in the Zarand region of Iran. Official sources in Iran are estimating a death toll of around 500 from the quake on Nov. 25, 2018, which hit 6.3 on the richter scale. A magnitude 6.3 earthquake struck western Iran near its border with Iraq on Sunday night, injuring more than 500 people and sending fearful residents running into the streets, authorities said.